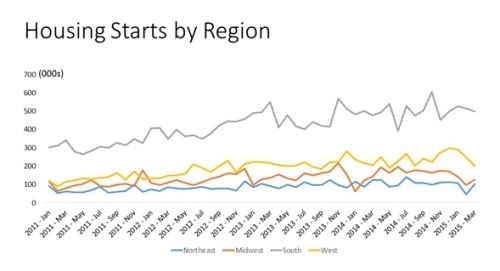 Housing starts and permits rose modestly in March after a very disappointing February. Total housing starts increased 2 percent to an annual rate of 926,000 from an upwardly revised 908,000 in February. Single-family starts improved slightly better at a 4.4 percent increase to 618,000 from a virtually unchanged 592,000 in February. Multifamily starts dropped again, to 308,000, the lowest annualized monthly figure since September 2013. Virtually all of the decline in the multifamily sector was in the West, with a small reduction in the South, finishing out the 8,000 unit drop from February to March on top of the 58,000 drop in February. Permits were down 5.7 percent overall, but driven again by a 15.9 percent loss in multifamily, evenly spread across three of the four regions. Northeast multifamily permits rose 55 percent to 90,000, the highest since June 2008 when a code change caused a one-time jump. The remaining three regions accounted for a 108,000 fall, offsetting the 48,000 increase in the Northeast. Single-family permits rose 2.1 percent to 636,000 on an annualized basis with only the West showing a decline of 2 percent, or down 3,000 permits, to 146,000 permits in March. But rising costs for building lots, construction and subcontracting labor and materials have put upward pressure on home prices, while consumers remain careful with their money, wage increases remain very modest and existing homes offer an alternative. Tight underwriting has removed some potential buyers, further limiting the pool of those able to buy. View this original post at NAHB's blog, Eye on Housing.